We want to hear about Audits and Quality Improvement Projects, done by junior doctors, focusing on issues relating to Geriatric Medicine and the care of older patients. Successful authors will have their poster displayed at the conference, with the top projects receiving the ‘Kate Granger Prize’ for dedication to improving standards of care for older patients. 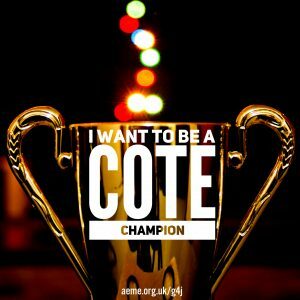 Winners will be declared our 2018 ‘CotE Champions’. The deadline for submission has now passed. Authors will be notified within 2 weeks of the closing date regarding whether or not their poster has been accepted. Judging of the posters and prize-giving will take place on the day of the conference. We look forward to seeing all the great work you have been doing to improve the care for elderly patients. If you would like to sign up to our mailing list, please enter your details in the adjacent form. We will use the information you provide to keep in touch with you and to provide updates on our projects and latest Geriatrics for Juniors events. We may also contact you to help us with research projects related to geriatrics and general medicine. By submitting your details, you are indicating you would be happy to hear from us by email. You can change your mind at any time by clicking the unsubscribe link in the footer of any email you receive from us, or by contacting us via our website. We promise to treat your information with respect. We will never pass your information on to third parties. Copyright © 2019 AEME. Powered by WordPress. Theme: Spacious by ThemeGrill.